McClain County is centrally located in District 21, directly south of Cleveland County, directly north of Garvin County. The total area of McClain County is 569 square miles and the population is approximately 34,506. Purcell, the county seat, has a population of 8,086. Newcastle is a close second in population, followed by Blanchard. The remainder of the population is scattered throughout rural areas of McClain County. 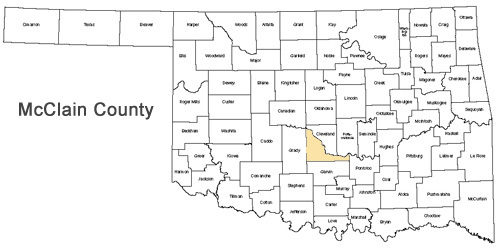 McClain County is serviced by seven local law enforcement agencies: McClain County Sheriff’s Office, with jurisdiction covering the entire county, Dibble Police Department, Purcell Police Department, Blanchard Police Department, Newcastle Police Department, Wayne Police Department, and Washington Police Department. The District Attorney’s office is located in the McClain County Courthouse at the corner of Second and Washington streets. The legal staff of this office consists of approximately 7 staff members including A.D.A.’s, support staff, and investigators. From time to time additional attorneys and/or support staff are reassigned from Cleveland County to McClain County as necessary.